Reports emerged yesterday that Northcliffe Digital is to restructure its Local People websites, with an end to the contracts of the freelance “contracters” currently on each site. Instead “dedicated community publishers” will be tasked with managing a group of the sites. 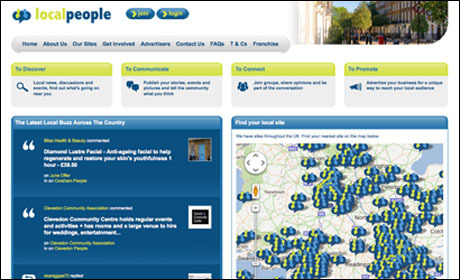 Northcliffe Digital has conducted a review of Local People sites. From August 2012, dedicated community publishers will be appointed to look after a portfolio of Local People sites that sit within Northcliffe Media’s overall footprint. The current publishing structure uses one freelance contractor per site. These contracts will expire in August. This approach means Local People will have the benefit of more experienced publishers covering a broader remit and will streamline the running of the business. Local People sites that sit outside Northcliffe’s footprint will be made available as franchises. The Local People websites attracted 840,000 unique visitors in May 2012. There are no other immediate plans to make changes to the sites. This entry was posted in Local media, Online Journalism and tagged Local media, local people, Northcliffe, northcliffe digital on June 8, 2012 by Rachel Bartlett. An interesting project in local reporting by Abendblatt in Hamburg was outlined by Felix Bellinger, managing director of mobile & apps at Axel Springer, at the News World Summit in Paris today. The project, called Mein Quartier (My Part of Town) saw on-the-ground reporters – who were freelancers appointed based on their “matching” to the district – filing stories from seven city districts in a bid to increase “local insight and intensify local coverage”. Mein Quartier, which is available to access via an iPhone app, started as a pilot project for Abendblatt, but this year it is being developed into a “large scale district campaign” and an “integral part of news reporting” for the title. We found the project very successful in terms of hits and feedback and in terms of business. He added that as well as reaching a new target group the project helped attract no advertisers. 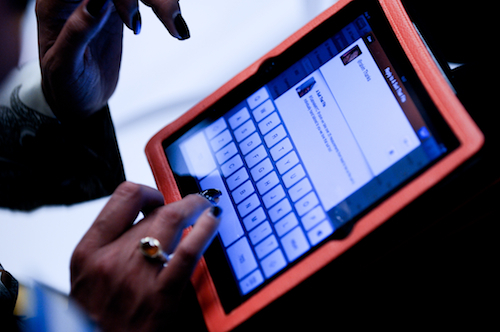 Building up local website and mobile fields means creating new space for advertisers. The newspaper is now moving into the “next phase”, he told the conference, which will see reporting from all 104 districts of Hamburg. And while the pilot project engaged 25 reporters on the ground, the expansion will see the entire editorial staff of Abendblatt reporting from the districts. As a result the district coverage falls within its mainstream regional content, which is paid-for as part of Abendblatt’s freemium model. During the pilot the project was free to view. Development is currently underway to create space on the website for each of the 104 districts. Work is also underway to develop the mobile app to enable it to map each district. There are also plans to publish a book by the end of this year featuring all the stories that have been published about Hamburg’s districts. This entry was posted in Hyperlocal, Local media and tagged #gen2012, Axel Springer, Hamburger Abendblatt, Hyperlocal on June 1, 2012 by Rachel Bartlett. 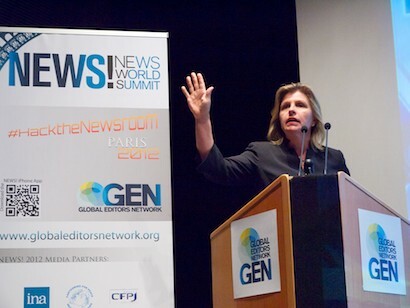 Local online advertising is one of the top opportunities for growth for news publishers this year, according to a new trends report by World Newsmedia Network due to be published in September and previewed at the News World Summit in Paris today. Local advertising is on the up – it is a great opportunity – but half is coming from pure players like Google, Microsoft, Facebook. Only a quarter is from newspapers, 10 per cent is going to local TV and about 11 per cent directories like Yellow Pages. We can’t let the pure plays and telecom groups take that money from us. We need to take that opportunity and run with it. The group’s new World Digital Media Trends report will also identify the Asia Pacific region as a key growth area. The opportunities for revenue are diminishing in traditional media – they’re in negative territory for newspapers, zero per cent growth in television and you see all kinds of opportunities for digital forms of media. The traditional media aren’t looking good. Traditionally the strong markets for online advertising have been the developed countries of North America, Europe and Japan but that’s starting to change in a big way and the developed world is starting to kick in with the advertising opportunities online. South Korea is the biggest consumer of downloading apps next to US, Sweden, South Africa and Japan. This entry was posted in Advertising, Events, Local media and tagged #gen2012, Global Editors Network, News World Summit on May 30, 2012 by Paul McNally. The Western Mail caused much debate yesterday after publishing a front page editorial responding to a report claiming that proposals had been made for records of meetings at the Welsh National Assembly to be translated into Welsh at an estimated cost of up to £400,000. In the editorial the Western Mail said this sort of service may therefore be “a luxury we cannot afford”. 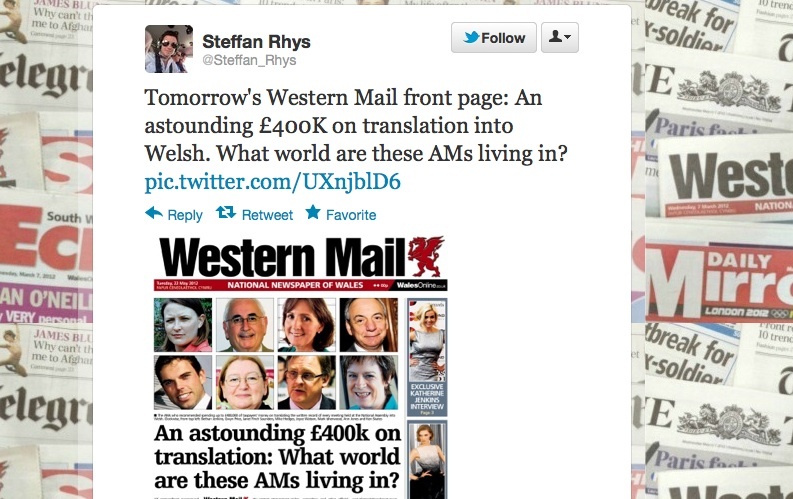 The report prompted a Twitter hashtag debating the decision to run the editorial called #westernfail and much press commentary, from the Independent’s Rob Williams here, to the BBC’s political editor for Wales, Betsan Powys, who said the article worked to “raise some questions about the value for money of a set of recommendations from politicians – albeit in pretty uncompromising terms”. We fully support the right of AMs and others to address meetings in Welsh or English, according to their choice, and the publication in both languages of the official Record of Proceedings of plenary meetings. But we believe the recommendation to translate all Assembly proceedings into Welsh, at such enormous cost, is a step too far in this period of austerity. At a time when front-line public service and benefits to poorer people are being cut, we cannot in all conscience support a huge increase in the National Assembly’s translation budget. That is why we back the Assembly Commission’s draft Bill and oppose the amendment proposed by the communities, equality and local government committee. At the time of writing the online version of the article had received 448 comments. BBC Radio Wales yesterday asked if the editorial is “an attack on the Welsh language?”. Chief reporter Martin Shipman, who secured the original story, said “this is not about the Welsh language” and that the newspaper will not be apologising and stands by the piece. In all conscience when priorities are being looked at we could not support the spending of a considerable amount of extra money on Welsh language translation services at a time when the poorest people in Wales are being hit by benefit cuts and public service cuts. This entry was posted in Broadcasting, Local media, Newspapers and tagged translation, welsh, Western Mail on May 23, 2012 by Rachel Bartlett. Earlier this year, a US study claimed that becoming a journalist is the fifth worst career choice. As well as citing factors such as stress, industry outlook, income levels and general working environment for the ranking, the study quotes a reporter as saying the younger generation “doesn’t care about the news”. This is against a background of continuing decline in public trust of communications professionals, no doubt exacerbated by the ongoing findings of the Leveson inquiry as it investigates the underbelly of journalism and politics. Of course it’s not all bleak. In many ways, this is a time of renaissance for journalism as our ways of gathering and disseminating news proliferate online. And journalism will always offer rewards that outweigh the financial ones for the majority of us. Nevertheless a life of low salary and high stress can take its toll, if not on you then for some of your colleagues. So why not do something small to help that collectively can amount to something big? The Journalists’ Charity “started in 1864 when a group of parliamentary journalists met up in a London pub to set up a fund to help their colleagues and dependents who had fallen on hard times. In the days before state benefits, grants were made to meet the costs of providing some of the necessities of life”. The Victorian novelist Charles Dickens was a founder supporter. These days it has widened its remit to include all journalists and is always ready to help them and their dependents with advice, grants and other forms of financial assistance. The Journalists’ Charity also runs a care home for journalists, Pickering House, in Dorking, Surrey as well as sheltered and extra care housing. Given that most of our pensions are not going to add up to much, that’s quite a nice safety net isn’t it? 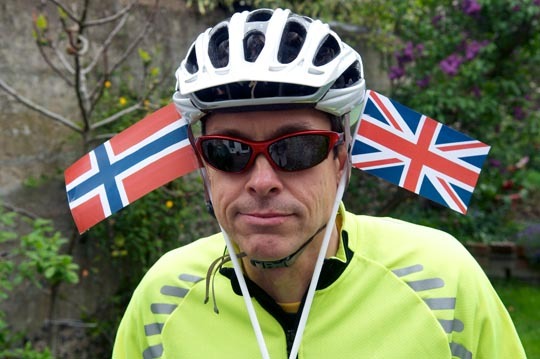 On 8 June I’m going to cycle solo and unsupported from Brighton (home of Journalism.co.uk) to Oslo, Norway to raise money for this under-appreciated charity. I will be cycling approximately 850 miles in 11 days, an average of 77 miles a day, cycling through England, France, Belgium, Holland, Germany and Denmark. You can do your bit by sponsoring a fiver or more on my sponsorship page and helping to spread the word via Twitter, Facebook etc. Sponsors who do not wish to remain private will be rewarded with recognition and thanks on our @journalismnews Twitter channel (58k-plus followers) so that’s pretty decent exposure, especially if you sponsor on behalf of your media-related business. And if you’re still not convinced that the Journalists’ Charity is a worthy cause, I will also be raising money for two cancer charities – alternative sponsor page here. This entry was posted in About us, Journalism, Local media, Magazines, Newspapers, Non-profit and tagged Charles Dickens, communications professionals, journalists' charity on May 14, 2012 by John Thompson. Alastair Machray, editor of the Liverpool Echo, applied to take on distribution of a Regional Growth Fund in the hope that it would improve the paper’s brand and “place them at the heart of the community”. The RGF is a government fund designed to be help create jobs through small businesses; the Liverpool Echo applied to be a partner and received £1 million to distribute locally. Speaking at the Society of Editors regional conference yesterday (Thursday, 10 May), Machray gave some pointers on the process, and outlined its pros and cons. “Applying to partner with the RGF is not a simple process, and is not to be approached alone,” Machray warned. The 60-page application for the RGF is time consuming and technical. He advised considering whether the necessary time to complete the application properly could be afforded and building a team and electing a bid writer – someone that knows the buttons to press for government departments, a secretariat, and an investment company to manage the money. The benefits of the fund have been numerous for the paper, with “great editorial coming out of it”, Machray said, “but securing the fund was more about brand than selling papers or increasing web traffic”. Machray also highlighted that they were approached to apply for the fund, indicating that the government still recognises the value of local papers. We have a place at the heart of government; our brands resonate, and this is a good place to be. Machray warned about dealing with trolls throughout the RGF process, and said to be prepared for criticism: “People were convinced we were trying to milk the wad”. A rumour circulated that the the Echo was taking a 60 per cent cut of the million pounds, when in actuality the paper did nit even take back the £4,000 it cost to put the bid together, he said. Machray also warned against involving third parties, such as businesses that offer “application stimulation”. When questioned if he would repeat the process, Machray said that while the move had been beneficial for the paper, he would want to see the outcome of the RGF on local businesses before investing time into it again. 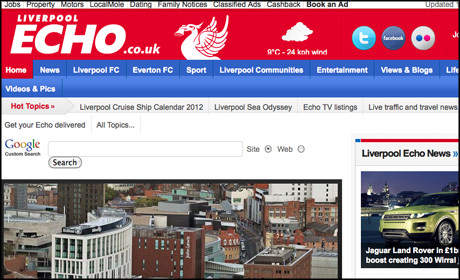 This entry was posted in Local media, Newspapers and tagged branding, Liverpool Echo, Regional Growth Fund on May 11, 2012 by Jonathan Frost. More than 800 sales staff at Johnston Press are to get iPads as part of the local publisher’s transformation to a “24-hour digital operation”, the company’s chief executive Ashley Highfield has told Computerworld UK. The move will enable remote working from many of the 1,500 sales staff, the article states. [The] regional newspaper group is deploying the Saleforce.com platform to support ad sales teams selling through new media channels, and adopting Google Apps to support a company-wide, cloud-based email system. Other media companies using Google Apps include Telegraph newspapers and News International, which also uses Salesforce.com. Last week Johnston Press reported a £143.8 million loss in 2011, after writing off £163.7 million from the value of its newspaper titles. In March Highfield signaled a move to “digital first”, later describing the publishing strategy for five titles moving from daily to weekly publication as “platform neutral”. This entry was posted in Local media and tagged Ashley Highfield, Computerworld, Johnston Press plc, Salesforce.com on May 2, 2012 by Sarah Marshall. A major report into the advancement of the hyperlocal press was published earlier this month, alongside a £1 million investment to stimulate the sector. Destination Local, a 15,000 word study, identifies the technologies, business models, and content opportunities for a successful hyperlocal media sector in the UK. The report states that new location-based technologies, such as mobile phones with GPS, “offer a potential revolution for very local – or hyperlocal – media”. 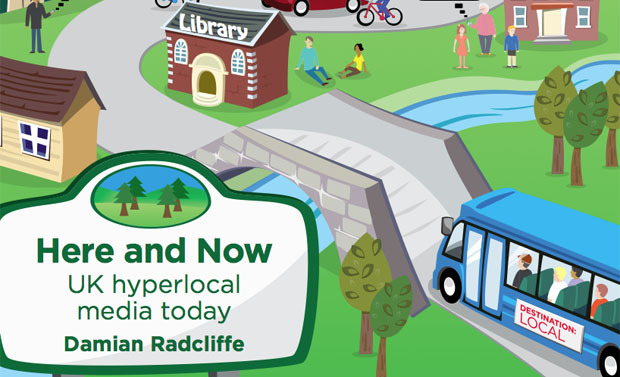 Author Damian Radcliffe analyses the challenges faced by the traditional media trying to access local people, and hyperlocal bloggers looking to widen their audience. The report was funded by the National Endowment for Science, Technology and the Arts (NESTA), an independent charity providing grants to digital innovation research projects. NESTA is offering 10 organisations up to £50,000 each to develop next generation hyperlocal media services. The Technology Strategy Board is running a parallel competition offering ten local cross-media platforms up to £56,250 of grant funding each. A spokesperson for NESTA told Journalism.co.uk that although traditional business models are being challenged by the web, “the democratisation of media means that actually there has never been a better or easier time to set up and run a local media service. Making it pay of course is another thing. The Destination Local programme aims to better understand the economics of delivering hyperlocal media at scale, in a sustainable way. The application process closes on 17 May and successful bids will be notified by 29 June. This entry was posted in Hyperlocal, Local media and tagged Funding, Hyperlocal, nesta, report on April 19, 2012 by Tabby Kinder. The Bristol branch of the National Union of Journalists is due to hold a peaceful demonstration later today following news that 20 jobs were at risk with publication of the Evening Post’s Saturday edition to be stopped from next month. The protest will take place outside an exhibition marking 80 years of the Northcliffe Media’s title from 6.15pm outside the Galleries in Bristol. The union branch says it has received much support from the local community. Last week NUJ general secretary Michelle Stanistreet said the changes to the Evening Post were a “shock announcement”. We call on the paper’s management to take steps to avoid job losses and enter into meaningful consultation with staff and their union representatives. 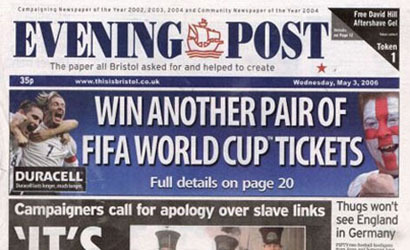 This entry was posted in Job losses, Jobs, Journalism, Local media, Newspapers and tagged Bristol Evening Post, cuts, Jobs, Local newspapers, National Union of Journalists, Northcliffe Media on April 17, 2012 by Rachel Bartlett. A group of journalism students at Staffordshire University have produced a newspaper to promote political and news comment site Pits n Pots. The unique publication, which will be delivered to some 50,000 houses across Stoke-on-Trent next week, features 16 pages of community and political news as well as features and profiles of community champions. The initiative saw volunteers given just three weeks to assemble a team, research and create content and finally design the paper. It was a brilliant effort by the whole team to get the paper produced in such a short space of time. It was a lot of hard work but we all had great fun working on it and we are all very proud of the finished result. I hope the people of Stoke-on Trent enjoy reading it. “The skills we have picked up from the teaching staff at Staffordshire University have helped us to put together a slick and professional newspaper. The project is backed by The Journalism Foundation which has been working with Pits n Pots to reprofile the site while boosting community engagement. Head of the foundation Simon Kelner, former editor of the Independent, and managing director Charlie Burgess, formerly of the Independent and the Guardian, visited the Staffordshire University newsroom during the process. This entry was posted in Hyperlocal, Local media, Newspapers and tagged Hyperlocal, Simon Kelner, staffordshire university, Stoke-on-Trent on April 5, 2012 by James Chapple.